Located in the heart of downtown, the Hyatt Regency Houston offers contemporary accommodations with sophisticated designs and premium lifestyle amenities. The 947 stylish guestrooms and suites feature Hyatt Grand Beds®, flat screen TVs, luxurious Portico spa products and panoramic views of downtown. 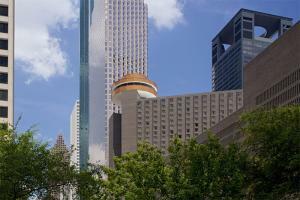 Centrally located, Hyatt Regency Houston is a quick eight to ten block walk from Minute Maid Park and the Toyota Center. Located just 26 miles from the George Bush Intercontinental Airport.